Obituary – Schultz, Helena Letha (Haefner) « Perry High School Alumni Association, Inc.
﻿Funeral will be at 2 p.m. Sunday at the First Christian church of Billings for Mrs. Lewis (Helena Letha) Schultz, 66, Billings, who died Thursday at Enid Memorial hospital after an extended illness. Rev. George Frey, pastor, will officiate. Burial will be at the Union cemetery at Billings under direction of Anderson Funeral home of Billings. Casket bearers will be Aubrey Tipton, H. B. Evans, Bill Hayton, Gene Carter, Buck Nash and Bill Huffmire. Mrs. Schultz was born March 14, 1911, near Perry, the daughter of Mr. and Mrs. Frank Haefner, who homesteaded north of Perry. She attended Perry area schools and was married in Perry, July 7, 1934 to Lewis Schultz, who survives. The couple established a home on the Haefner homestead located eight miles north and one and one-fourth mile west of Perry. They moved to Billings in 1952. 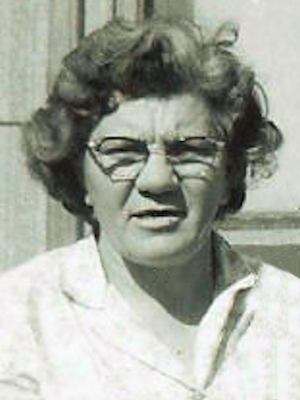 In addition to her husband, survivors include two daughters, Mrs. Virginia Minor, and Mrs. Fred (Kristina) Sanders, both of Billings; two sons, Lewis Jr. of New Deal, Texas; and Jerry Schultz of the home; two brothers, James and Harry Haefner, both of Perry; and seven grandchildren. Memorial contributions may be made to the Oklahoma Medical research foundation for arthritis. Anderson Funeral home will serve as custodian of the fund.